Have you ever seen a miniature doll or hat just lavished with tiny ribbon roses? These tiny blooms can be one of the most effective embellishments for a miniature project. And as impressive as they are, they are also very simple and inexpensive to make too! You will need a rose tool, and silk ribbon. For most applications, I use 4mm ribbon for roses, but if you want larger roses, you can use 7mm, or if you are working in a smaller scale, try the 2mm size. The only other supply you will need is white glue. You will find it easy to use the glue if you have it placed in a fine tip applicator. So gather up your supplies and give it a try. And if your first rose or two (or ten) don't look particularly lovely, don't give up. This is simply a matter of technique and practice. Learning how tight to pull the ribbon, how much glue to use, etc are all a matter of trial and error, but once you have it, you will use this technique over and over again! You will need a rose tool, (available in my shopping cart) 4mm silk ribbon, and glue. If you have problems printing out this lesson, use the link below to download the page in PDF format. 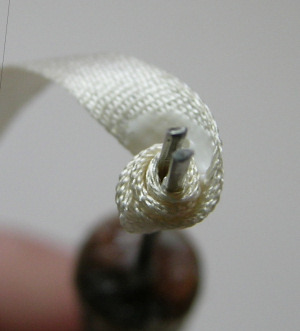 Place the silk ribbon thru the open eye of the rose tool, with a small tail extending out beyond the tool. (PLEASE NOTE: In this tutorial, I am using more glue than I usually would, in order that you can SEE where the glue is placed. 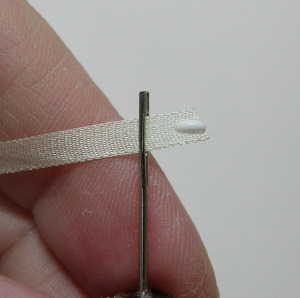 When applying glue, just the smallest dot from a glue syringe is sufficient to hold the silk ribbon. Rotate the tool 2-3 turns. 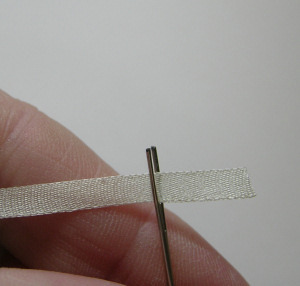 Place a small bit of glue at the base of the ribbon and continue to turn. 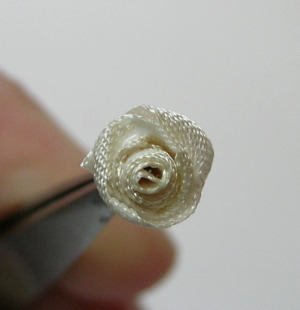 These 2-3 twists form the center of your rose. Now fold the ribbon back against it self, and continue to gently twist the ribbon tool, winding the folded area of the ribbon around the center. 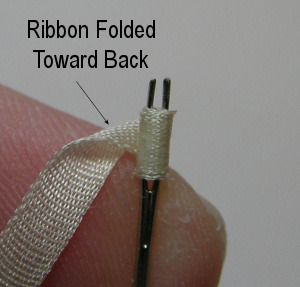 Apply a tiny dot of glue at the base of the ribbon just past the fold. This folded glued section forms the first petal. Fold the ribbon back on itself a second time, and continue to turn the tool. Glue the base of this second folded petal to the center of the rose. Here is a top view of the rose with 3 petals glued into place. 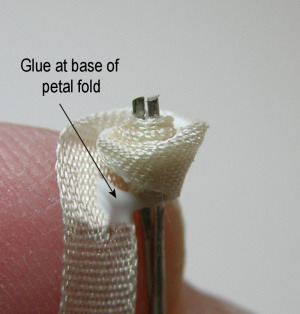 This photo shows another fold (petal) being glued into place. 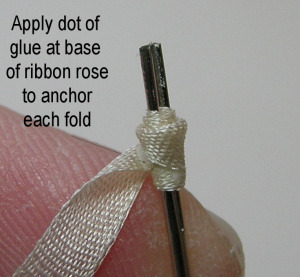 Notice that the glue goes at the BASE of the ribbon, so that the petal is allowed to extend out from the rose center. When you have as full a rose as you want, simply glue down the end of the ribbon to the base of the rose and cut off the excess. Slide the rose off your rose tool and allow to dry before handling. When the rose is dry, you may want to snip off the pointed bottom side of the rose to make it easier to glue into place in some applications. Don't throw that tiny cut off piece away! Take a close look at it! It is a 1/2 or 1/4 scale rose all by itself, and can be used in your tiniest projects. Ribbon roses are usually made using the 4mm ribbon when working in 1/12" scale. 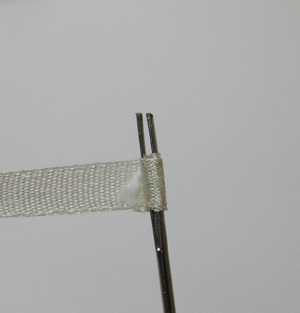 The same techniques and tool can be used with smaller or larger ribbon sizes for other projects.